Central Bank Governor, Sanusi Lamido Sanusi, wednesday, denied allegation that he copied the research work of a United States based Nigerian Professor, Victor E. Dike and presented it as his own ideas at a public lecture he delivered in Edo state on November 26, 2010. Sanusi who refuted the allegation via a press statement that was issued by the Central Bank of Nigeria, CBN, Wednesday insisted that he did not write the said paper that culminated to the lawsuit currently pending before the Abuja Division of the Federal High Court….Read the story HERE if you missed it. Meanwhile continue. It will be recalled that the court presided by Justice Adamu Bello, on Monday, summoned the CBN governor to appear on May 31 to defend himself over his alleged complicity in acts of plagiarism. The Court equally granted the plaintiff, Prof. Dike, who is an Adjunct Professor at the School of Engineering and Technology, National University, Sacremento and Chief Executive Officer and Founder of Centre for Social Justice and Human Development in California, leave to paste the court processes at the Notice Board of the apex bank, situated within the Central Business District, Cadastral Zone AO, of Abuja. However, the CBN boss denied receiving the court papers, just as he refuted allegation that his security personnel thwarted efforts by the court bailiff to effect service on him. 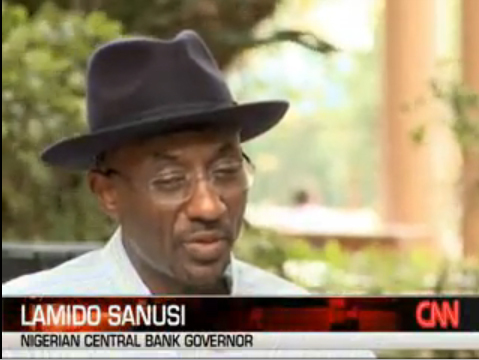 The statement which was signed by the Director, Corporate Communications at the CBN, Mr Ugochukwu A. Okoroafor, reads: “The attention of the Central Bank of Nigeria has been drawn to reports in the media regarding a suit against the Governor, Sanusi Lamido Sanusi, by one Victor E. Dike, who is said to be a professor of Engineering and Technology, National University Sacramento, USA. “It is important to provide some clarifications on the matter. First, as at the time of release of this statement, no court papers in respect of the said suit, had been served on the Governor. “Furthermore, and for the avoidance of doubt, we wish to state categorically that Mallam Sanusi Lamido Sanusi did not write the said paper. Governors of the Central Bank of Nigeria, just like Chief Executive Officers of similar institutions in Nigeria and abroad, deliver papers, not in their personal capacities, but on behalf of the institutions for which they are chief spokespersons. “In the case of the CBN, such papers, even though presented by the Governor, represent our collective views and are prepared by professional researchers in the relevant departments of the Bank. We can vouch that such papers are prepared in line with strict global and ethical standards. “As a responsible public institution, we always cooperate fully with court officers and our well trained and responsible security officers have ever been under strict instructions to treat them with the appropriate dignity and respect they deserve. “While awaiting details of the alleged suit, it is pertinent to state that speeches delivered by the current Governor, focus on the core mandates of the Bank and are direct contributions to discourse on national development. Specifically, the plaintiff, told the high court that he was the original author of a research wok entitled:”Review of the challenges facing the Nigerian Economy: (Is national development possible without technological capability? ), which he said the CBN boss copied verbatim and delivered as his paper during the eight convocation ceremony of Igbinedion University, Okada, Edo State. Prof Dike said he was forced to approach the high court for redress upon discovering that the CBN governor had in six separate occasions, plagiarized his intellectual works, just as he has asked the court to make a declaration that the defendant is in breach of the copyrights of the plaintiff.